Pressure pumps produce consistent high pressure (55 psig max) at high flow rates (5 gpm.) These pumps are ideal for VIP interior aircraft with independent water systems that are separate from the OEM pressurization system or for aircraft with vented (non- pressurized) water tanks. In either case, the pressure pump will supply the VIP points of use with pressure and flow rates that VIP passengers expect from a high value aircraft. There are two configurations of this pump – one with a vertical outlet port and the other with a horizontal outlet port. The Booster Pump produces a consistent boost pressure (24 psid max) at high flow rates (5 gpm) at 400 Hz. Aircraft designed for commercial airlines have potable water systems that supply pressure and flow rates, typically 25-35 psig at flow rates, which are consistent with airline usage requirements. These designs do not meet the requirements of a VIP interior which often include one or more showers. The pump is ideal for VIP aircraft. Installed as a booster pump to the OEM pressurization system, typically on Airbus or Boeing VIP Interior aircraft, this pump will boost the OEM water supply by 22-24 psid so that all points of use, including showers, will have pressures as high as 55 psig at high flow rates. This pump was originally designed for supply to large business jets with variable frequency power. In the application, the pump is referred to as the Variable Frequency Pump. Circulation Pumps produce consistent low pressure (21 psig max) at flow rates up to 5 gpm. 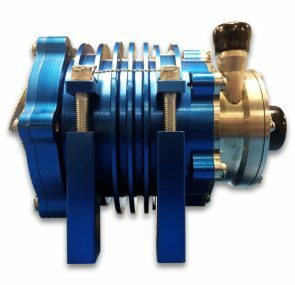 This pump is ideal for low booster pump applications and has been utilized with in a hot water circulation loop application. Click on the PDFs below for general product specifications, or contact us directly.